Brenda Michael, daughter of ProRodeo Hall of Famer Benny Binion, has been chosen to receive the Ken Stemler Pioneer Award at the Cowboy Ball at the ProRodeo Hall of Fame Aug. 7. 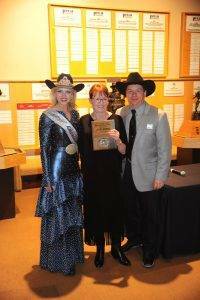 Michael was chosen for her commitment to the ProRodeo Hall of Fame with her continued support of the Benny Binion World Famous Bucking Horse and Bull Sale, which benefits the Hall of Fame and youth educational scholarships. She has continued the legacy of her father and his dedication to the ProRodeo Hall of Fame, and has demonstrated her own commitment to the future success of the Hall and its mission. The Ken Stemler Pioneer Award recognizes those who have provided ground breaking, innovative ideas and forward thinking that help the development, advancement and success of the PRCA and/or the Hall of Fame and their missions. It is given to recognize those whose significant contributions through their service, dedication and positive influence, have enhanced the scope, reach or future success of both organizations. Ken Stemler was the recipient of the inaugural Pioneer Award in 2014, given to him posthumously, and it was named after him starting this year.